Joël Robuchon was never meant to be a chef. In fact, he intended to become a priest. Born into a modest, Catholic family of five children in Poitiers, to a stonemason father and housewife mother, he entered the seminary at twelve. However, when his parents were unable to keep up with their youngest son’s tuition fees, Robuchon turned in his bnlack clergyman’s robes and invested in a set of chef’s whites, deciding to dedicate his life to cooking and, at fifteen, took on an apprenticeship at Relais de Poitiers. At twenty-one (1966), he joined les Compagnons du Tour de France; a role that entailed travelling around France working with different master chefs and introduced him to different regional cuisines, produce and techniques. It was during this period that he worked with Jean Delaveyne at le Berkeley, whom Robuchon would later name his greatest teacher. After seven years, he was hired as head chef at Hôtel Harmony La Fayette in Paris where he had to turn out three hundreds meals a day. Robuchon discovered Japanese cooking in the seventies and, after winning the MOF in 1976, Bocuse invited him to teach pver there. The simplicity and technique he witnessed impressed and stayed with him ever since, as did an affection for the Far East. After his return to France, he was head chef at Les Celebrités in Hôtel Nikko, before opening his own restaurant, Jamin, in 1981. His success here was immediate and immense. As it smashed Michelin records, winning its first star after three months then all three in three years, Jamin became a legend and set Robuchon up as a first among equals, a position Gault Millau corroborated by naming him ‘Cuisinier du Siecle’ in 1990. Eventually, in 1993, he moved from the original Jamin site to a larger space at the Hôtel Le Parc on avenue Raymond Poincaré. 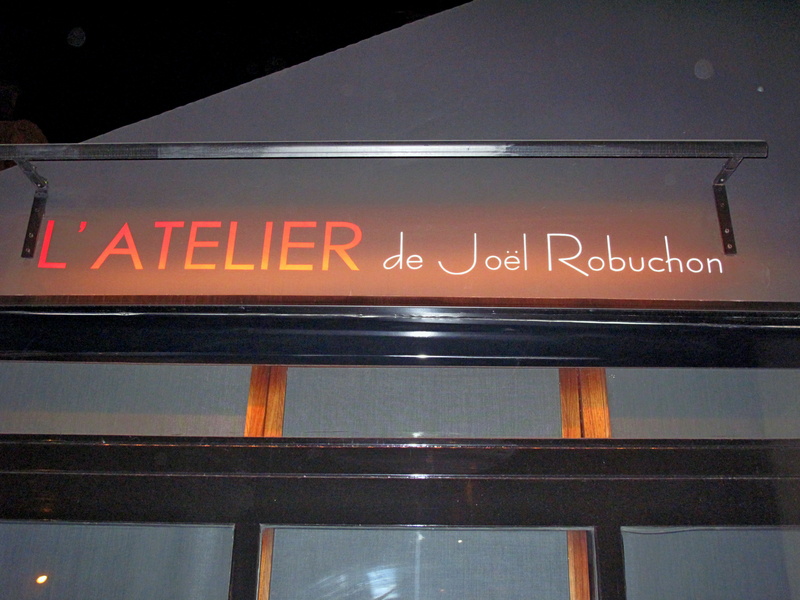 In 1996 (5 July, for those taking notes), the fifty-one year old Joël Robuchon retired, closing his restaurant and handing it over to Alain Ducasse. He cited the daily strain he felt under as well as the wish to leave whilst he still had a choice, rather than when he would be forced to. Since the early nineties, he had told friends and reporters too of his intended retirement, but the world was still shocked when it really happened. That being said, no longer behind the stove, the chef had not abandoned the industry completely, maintaining consulting roles at several restaurants, including Taillevent Robuchon in Tokyo; advising some French food companies, like Fleury Michon; appearing on TV shows; and leading the team that revised the Larousse Gastronomique. Robuchon was unable to resist playing the restaurateur forever however and in 2001 he launched Robuchon à Galera in Macau. He followed this up with a much-anticipated return to Paris two years later with l’Atelier de Joël Robuchon in May 2003, claiming ‘I’m coming back through a very small door’. ‘What I have in mind is a place with a very relaxed convivial atmosphere. That’s what I think people want. There will be lots of interaction between the chef and the customers’. What he really had in mind was a new concept of essentially a sushi bar serving French tapas. Taking the title of his 1997 cookbook, co-authored with Patricia Wells, and an idea that hit him when in Japan, he joined the, by then, established tradition of gourmet chefs opening bistro/more casual restaurants. The formula worked. Queues formed around the block. The model was rolled out (along with slightly more formal les Tables, les Cuisines, Cafés, Salons de thé and even Restaurants de Joël Robuchon) in Tokyo, Monaco, Las Vegas, New York, London and Hong Kong. Le Figaro screamed, ‘c’est une revolution!‘ while Michelin has since bestowed upon him a total of twenty-five stars. 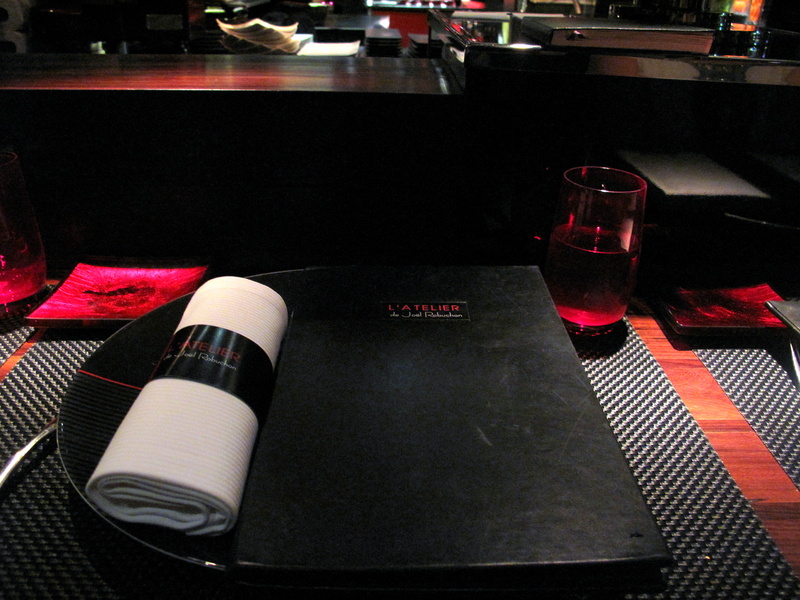 At the original l’Atelier, the kitchen is run by the trio of Erick LeCerf, Philippe Braun and Eric Bouchenoire. Whilst in ‘retirement’, Robuchon had placed LeCerf at Astor and Braun at Laurent, were both won two étoiles each; Bouchenoire, MOF, had remained at his side. 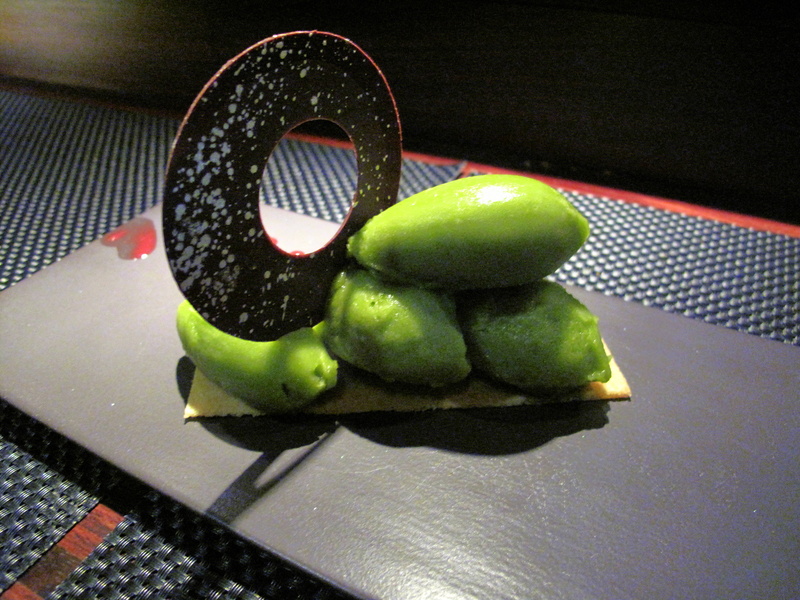 Together, in 2006, they earned this l’Atelier its own first macaroon, then a second two years later. Robuchon was always known as one of the shier, more modest chefs, never leaving his kitchen to tour the dining room – when asked to describe himself as a dish, he said he would be a potato (or he may have said ‘un pomme de terre’). It was thus a surprise to many when he launched a restaurant where the chefs are so utterly exposed. If truth be told though, it seems behind the scenes he was not so timid. Gordon Ramsay, whom along with the likes of Eric Ripert, Benoît Guichard, Eric Briffard, Frédéric Anton and Michael Caines he at some point mentored, moans that he ‘was like a tortured child’ at Jamin and there is a story involving Robuchon, a plate of hot ravioli and Ramsay’s head. It also seems that after years spent in front of the television screens, Robuchon may have grown fond of entertaining an audience: ‘in the past, I never came out of the kitchen, but television liberated me and made me more relaxed’. The Paris l’Atelier is found in Saint-Germain-des-Prés in the 7th. It is adjacent/semi-attached to the Hôtel Pont Royal, although each is independent of the other (for the record, the venture’s actual financial backer is Ted Margellos, a loyal former customer of Robuchon’s). This hotel was once the haunt of the city’s literati; its bar being a favourite for writers such as Arthur Miller, T.S. Elliot, Truman Capote, Gabriel Garcia Marques as well as that existentialist twosome of Jean-Paul Sartre and Albert Camus. 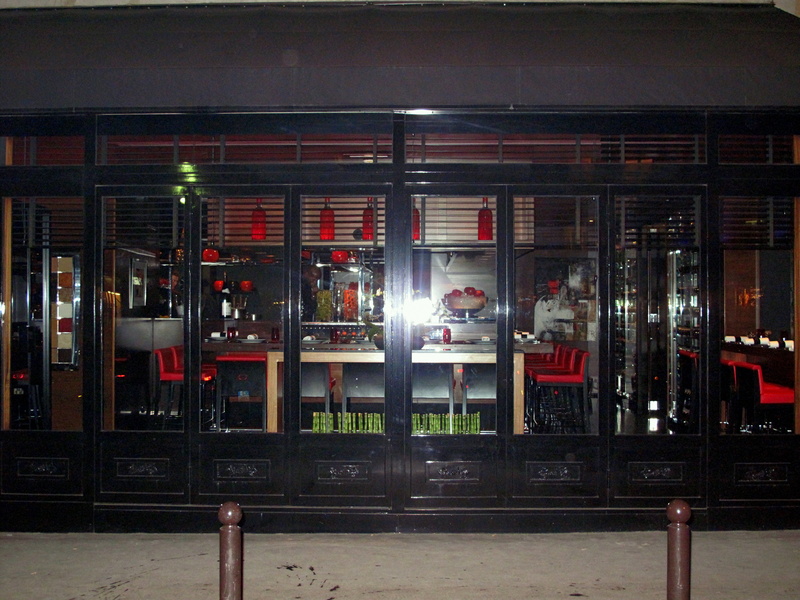 Windows wrapped in black wood form the restaurant’s façade which protrudes out onto the pavement. The entrance, which sits betwixt two little olive trees, opens onto a small ante-room wherein one waits until whisked either to the right or to the ‘tourist’ left. The interior, designed by Pierre Yves Rochon (credits include Essex House, NY and Château les Crayères, Reims), is basically black, red and stainless steel; there is ebony marble from Zimbabwe and dark cherry Ballesandre wood from the eighteenth century. On either half, a u-shaped bar borders an open kitchen that doubles as the ‘theatre’. The spectators takes their places around it on high, metal-framed stools upholstered in lipstick red leather and set snugly side-by-side. On a shelf above the counters, conical flasks of colourful, pickled vegetables are highlighted by recessed halogen spotlights, whilst on the counters themselves one can find such adorning articles as vases of faux apples on faux ice; mandarins sitting on pots of black pepper; and bowls of pasta. On the far right, the restaurant’s open cave rests behind a sheet of glass. Modern paintings that resemble those of Robuchon’s favourite artists, Pollack and Rauschenberg, hang throughout. Each guest has an individual woven vinyl black placement; Bernaudaud crockery; Ercuis cutlery; frosted red glass and ashtray-ish side dish; and a thick, starched linen napkin nestled in a paper choker. Chefs, neither in traditional white nor wearing toques, are dressed in black Zhongshan suits with red piping; the same goes for the serving staff who occupy a small moat between the customers and kitchen. The dim dining room and dark attire allows the designer to focus diners’ attention where he wants. To do this, highly focused lighting is used to illuminate decorative details; the hanging charcuterie; bottles of vibrant veg; workstations in the cooking area; and, most importantly, the plates of food themselves. The restaurant (like Jamin) has forty seats, which are intimately close to each other.The atmosphere is a fairly lively one with the sights, sounds and steams of the cuisine a backdrop to the constant chit and chatter of those eating. Once the staff have allowed you through the doors that remain locked at all times – yes, including whilst the restaurant is open – and shown you to your seat, the menus are already ready at the table for perusal. There are many dishes on offer, on many menus; le menu « découverte »; l’ALC; la carte des plate en petites portions dégustation; as well as off-menu daily specials repeated by servers/euses on arrival. Les Pains: Baguette et pain de campagne. 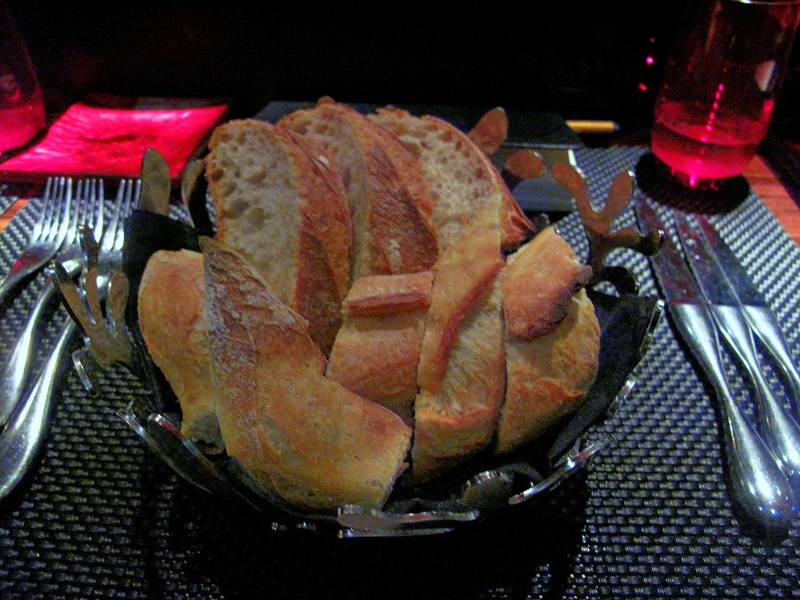 Baguette and country bread were bestowed from a communal metal basket. Bar the baguette being slightly more chewy than crunchy, both were unworthy of note and seemed shop bought. Its supply from a shared source was a little inconvenient – with the fact that it was at times out of reach more off putting than the worry of where others’ fingers could possibly have previously been. More shocking (and heartbreaking) was the absence of any butter. Entrée 1: le Foie Gras de canard chaud avec un confit de coings au gingembre. 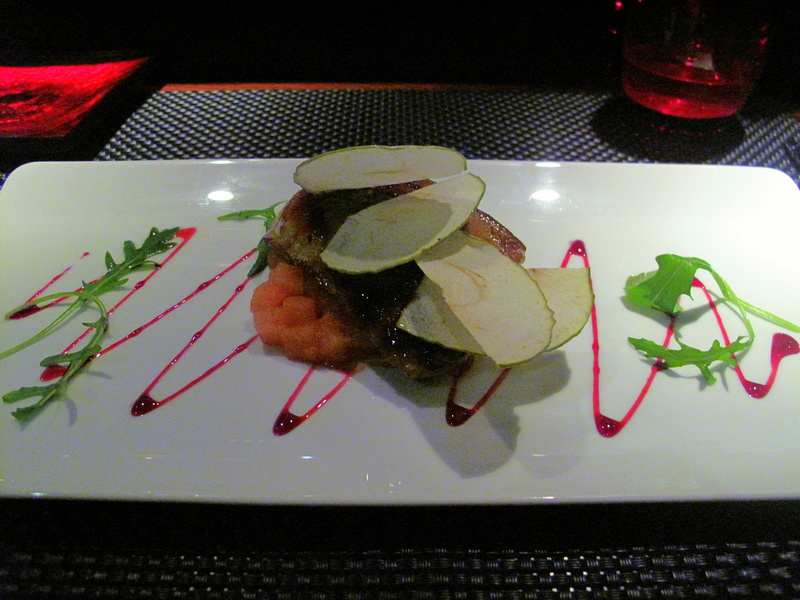 A lobe of glistening pan-fried foie gras, lying over gingered cubes of confit quince and inset with a series of green apple semi-slices, resembled a stegosaurus; rocket leaves and skinny streaks of hibiscus sauce criss-crossed the plate beneath. The foie was soft, though not as molten in its middle as I like, with a supple, though not crisp, skin; though it at least had decent taste. For the record, it had not be deveined. The fruit marmalade was a disappointment: warm, soft squares were neither sweet nor tart as was expected, but actually rather bland whilst any ginger spice that was there went wholly unnoticed. The apple wedges, which had started to surrender their positions immediately on presentation, were sweet, sour, almost sticky and the surprise highlight here. Entrée 2: la Langoustine en ravioli truffe à l’étuvée de chou vert. 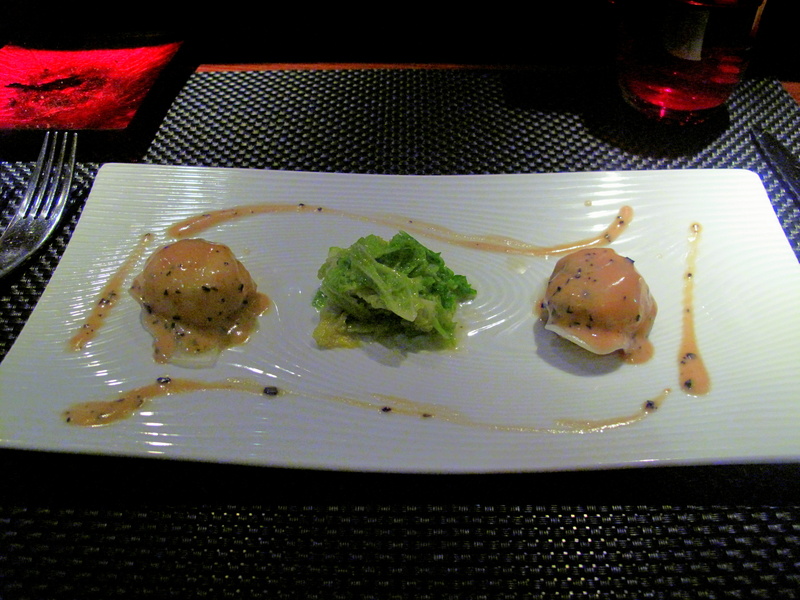 Two plump ravioli, crammed with langoustine and soused in truffle and foie gras sauce, were separated by a bundle of steamed cabbage leaves and surrounded by wavy splashes of more of the same sauce. Each round ravioli pasta – soft and delicate – was well-made, however had a strange, possibly too eggy taste, which did not complement the creamy, rich flavoured filling. Its smooth crème was another mixed blessing. The foie was distinct and gave the sauce some force, but the truffles were utterly ineffective. The springy, light and bright salad was, on the other hand, quite agreeable. Entrée 3: l’Os à Moelle relevé d’une pointe de moutarde à notre façon. A grilled slice of rustic bread, slavered with bone marrow mixed with Orléans mustard ‘our way’, was planked upon a barren beef bone pedestal, the whole plate sprinkled haphazardly with parsley, rocket and baby beet. The moelle was indeed unctuous and satisfactorily fatty in nice contrast to the crunchy toast. The leaves left a pleasant leafy pepperiness. Moutarde d’Orléans meanwhile, a medieval condiment made with Orléans vinegar and Guérande fleur de sel, although it made for a slightly spicy addition, more was anticipated from it. An old, but rare, mustard, noted for its creamy relish, was first discovered when wines being transported to Orléans from Tours and Anjou, having turned to vinegar in transit, were taken to local vinegar producers eventually to be used by neighbouring mustard makers. This was, however, still an able dish, but certainly under-seasoned and could have been hotter. Plat Principal 1: le Ris de Veau clouté de laurier frais à la feuille de romaine farcie. 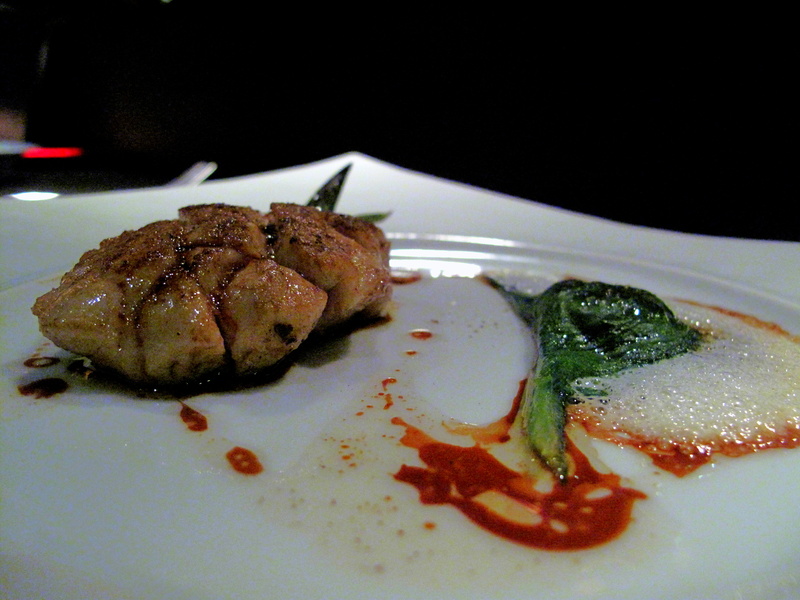 Bay laurel leaf-studded veal sweetbread, prepared à la plancha, was presented in the likeness of a pineapple and partnered with Swiss chard leaf stuffed with onion compote and framed with an emulsion of its cooking juices. Soft, smooth ris was pleasant but would have been better with some caramelisation coating it, without which, it simply seemed incomplete. Another negative was that the bay had imbued the offal only where it had stabbed it, leaving its extremities tasting rather plain. Some jus de veau concealed under the gland was toothsome as was the emulsion that embroidered the crisp chard. The sweet, rich onion within this was another good point. Plat Principal 2: le Merlan frit Colbert, beurre aux herbes. 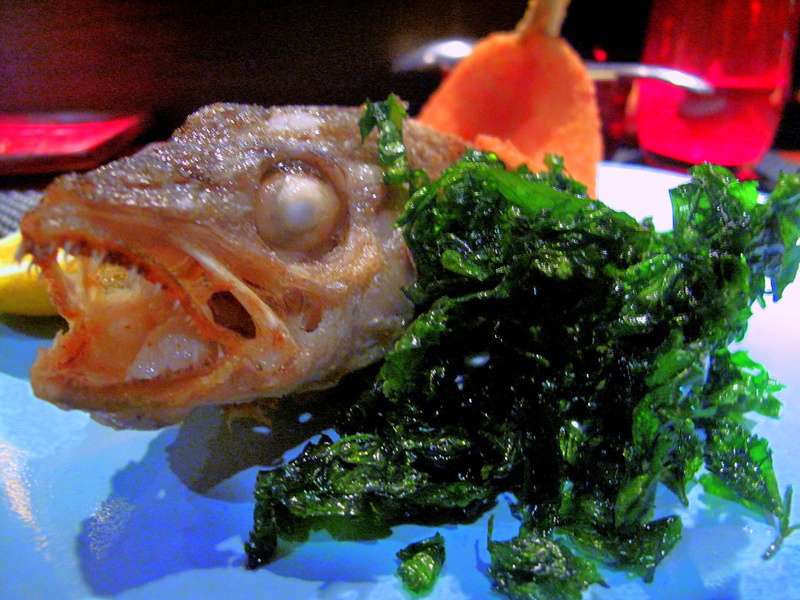 A whole whiting – its back splayed open, spine removed then interior breaded lightly, deep-fried and with the exposed cavity filled with beurre Colbert whilst its tail and head remained intact – sat adjacent a simple lemon half and pile of fried parsley on an aquamarine plate that mimicked the fish’s natural habitat. The merlan’s soft, white flesh had delicate and fresh flavour, which was complimented well by the sweet, peppery herb butter. The technique in cooking the whiting was excellent – crisp, crumbly and with not a spot of excess oil present. The same could not be said of the parsley, which was sapid, but a tad greasy. For those curious, ‘Colbert’ is a reference to Jean-Baptiste Colbert (1619-1683), Louis XIV’s Intendant des Finances. In addition to being publicly a capable minister, he privately divided his time between his three loves – women, wine and gastronomy: ‘I enjoy nothing more’, he wrote a friend ‘than making love, dining well and drinking the rich red wines of Bordeaux. And I am never more pleased when I can carry out these activities all at the same time’. Many recipes have since been named after this renowned gourmet (or were devised by his chef inconnu – evidence is still uncertain). 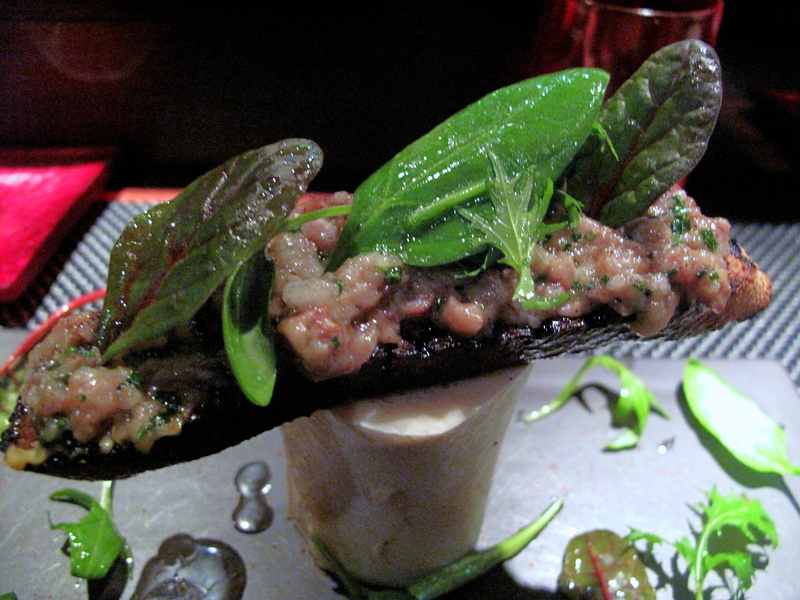 This dish, on Robuchon’s menu in some incarnation since Jamin days, is one of his classics. It is therefore fitting that his most famous creation came teamed with it – le purée de pommes de terre. The recipe, much argued over, involves a variety of Ratte potato, an equal amount of cold butter and a quantity of warm milk. This breed of tater, unusual when Robuchon first started using it, albeit a chef’s favourite now, has excellent flavour, verging on nutty, and smooth texture. The mash, which came in a cute mini Staub cocotte, was almost syrupy and gooier then expected. It was tasty, though hardly unforgettable, and in reality, despite making for a fine pair, only a little of it was needed to sauce the fish. Dessert 1: les Tartes de tradition assorties. An elongated tray, decorated by drops of berry coulis, was delivered with a quintet of various tarts resting on swirls of more hibiscus sauce: dark chocolate, lemon, ‘Snickers’, apple and cinnamon. Each ‘sensible’ segment was well-constructed and quite pleasing. The dark choc slice, made with Valrhona Araguani 72%, had thick pastry, but quality bitter coco taste with a hint of fruit. Lemon, with biscuit-like base and moussy, tart middle was nice whilst the shimmering ‘Snickers’ (basically milk chocolate, toffee and peanuts), silky and crunchy. Moist, fruity and subtly spicy apple had good textural variation and the cinnamon, with crusty pâte sucrée and a thin layer of sweet condensed milk, was quite decent. Dessert 2: le Chocolat « sensation » avec un sorbet bitter sur un crémeaux Araguani. Within a conical glass cup, which came set atop a small glass bowl bearing black cord and small red boules, dark chocolate crème and chocolate Chantilly came capped with a thin disk of choc punctuated by droplets of fruit coulis. The cocoa, again Valrhona Araguani 72%, was again a good choice. The creamy mousse hid buried bits of crunchy cookie that offered some textural variation and the coulis was notably sharp, but on the whole, this was very dull. Service was very pleasant. Although clearly busy and even stretched at times, staff were friendly, patient and informative. Sometimes dishes were a little slow to be removed and new ones brought before old ones were gone, but this is a minor objection that can be overlooked given the casual setting. There was also the issue of the physical challenge of placing/taking plates from over the counter, though of course, this is not the staff’s fault. Unfortunately, I found the food unimpressive. 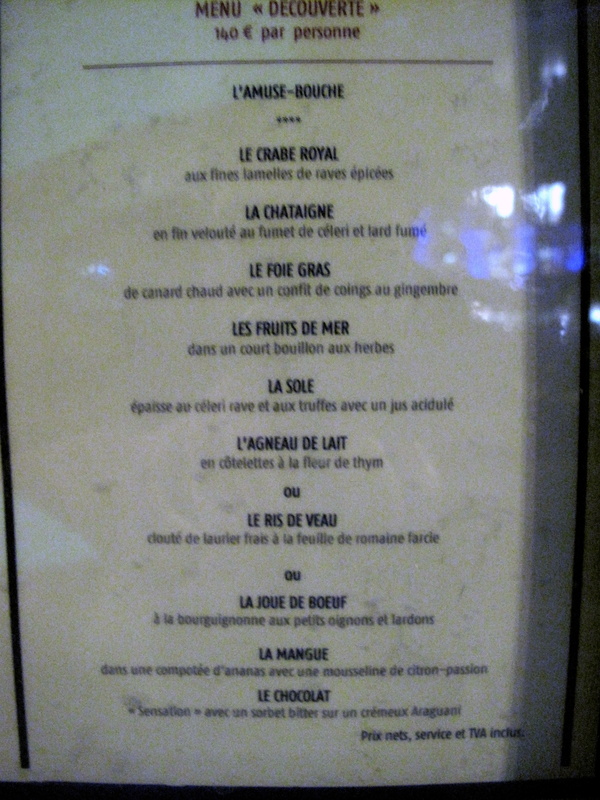 The bread was basic; foie gras had disappointingly meek flavours; and langoustines were very forgettable. The l’Os à Moelle was an improvement on what went before and, though it lacked sufficient seasoning and spice, was alright. That being said, having tasted bone marrow on toast at St. John, this was a very inferior substitute. The sweetbread was another let down: no caramelisation on its crust, little natural savour and simply an improper infusion of flavour from the herbs. The merlan was much better. This simple fish dish was well-executed and tasty; its accompanying potato purée was nice though not monumental. The collection of tarts was very good, each technically adept and delectable. The second dessert, the chocolate ‘sensation’, on the other hand, was terribly boring and unremarkable. I was also fortunate enough to try a little of the basil sorbet; vanilla and chocolate pots (la Vanille); and le Marron desserts and I feel les Tartes were the best of all these. On that last point, it was thanks to the kindness of strangers that I was able to try a few extra plates. I readily admit that on arrival I was struck at just how intimately tightly I had been seated between others – not that it bothered me, but it was just unusual. 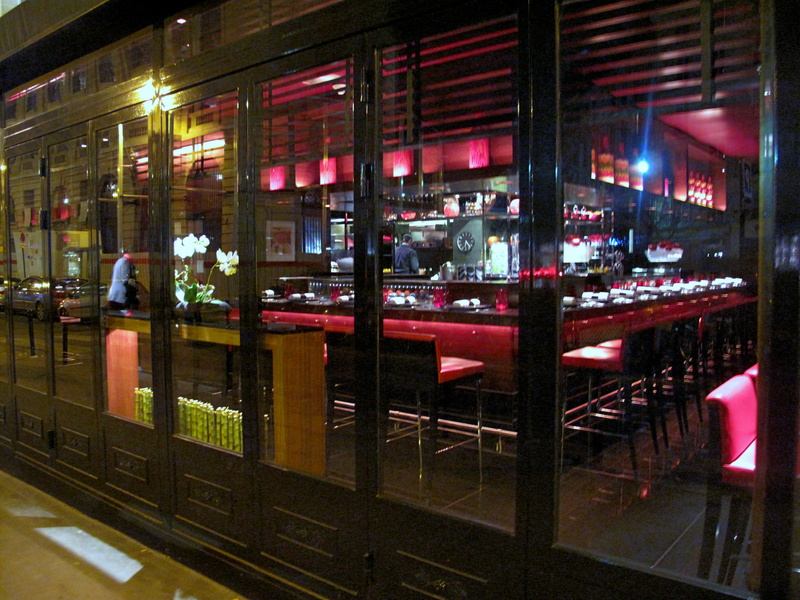 Robuchon remarked, ‘I wanted to do something friendly in Paris, I am always surprised to see how the Japanese, usually very reserved, relax and chat in sushi bars’. And this is exactly what he has achieved. I really got on famously with an American lady, her son and daughter that were to my right; and very well with a pair of Japanese ladies on my left, even though they spoke but a few words of English and no French. 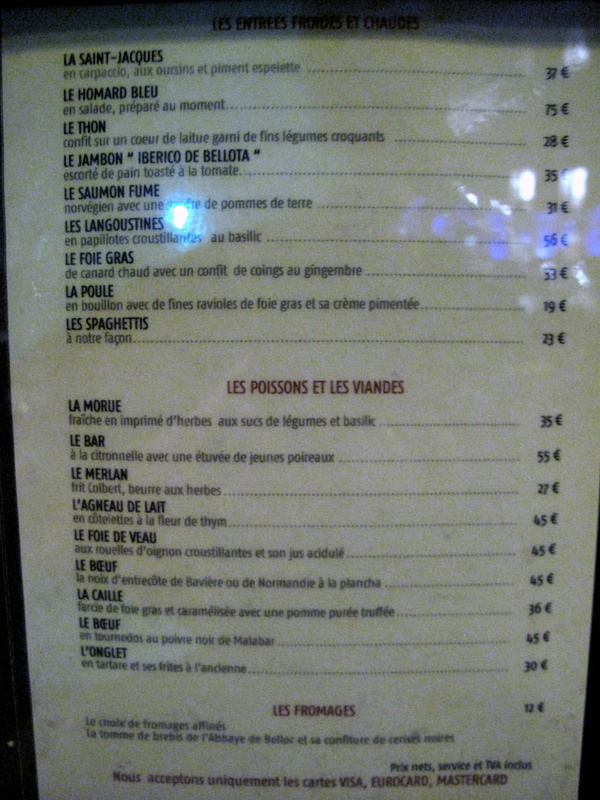 After helping the Américaine with translating the menu, we then started shared bites of each other’s dishes (for the record they liked the Os à Moelle especially). As they left, they also left me an incredibly kind and unexpected gift. From our conversation I gathered that she was quite the wine lover, thus she first surprised me with what she knew best – a dessert wine. Then, even more generously, in the best way anyone can surprise anyone else – with a dessert. 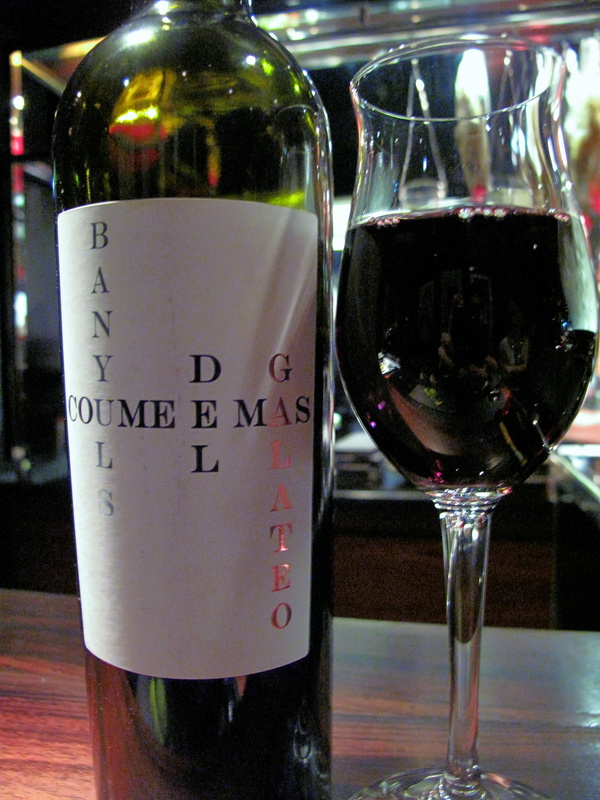 This was le Chocolat, which was matched with a glass of Banyuls Galateo, Coume del Mas that was deeply fruity with a caramel hint. Without this touching incident, the evening would have been a huge letdown. For me, Robuchon’s name has been synonymous with outstanding ingredients, craftsmanship, simplicity and simple deliciousness. I, of course, did not expect the same calibre of cooking that coerced so many to fly across the world to Paris just to eat at Jamin then go straight home (happy), but I guess I just anticipated more than I saw. My main protest was with the produce, which was simply rather standard stuff; the langoustines and sweetbread stood out for their lack of quality. Another issue was the wanting for finesse, manifest in the foie that had not been deveined; poor technique with the bay and ris; and the greasy parsley. 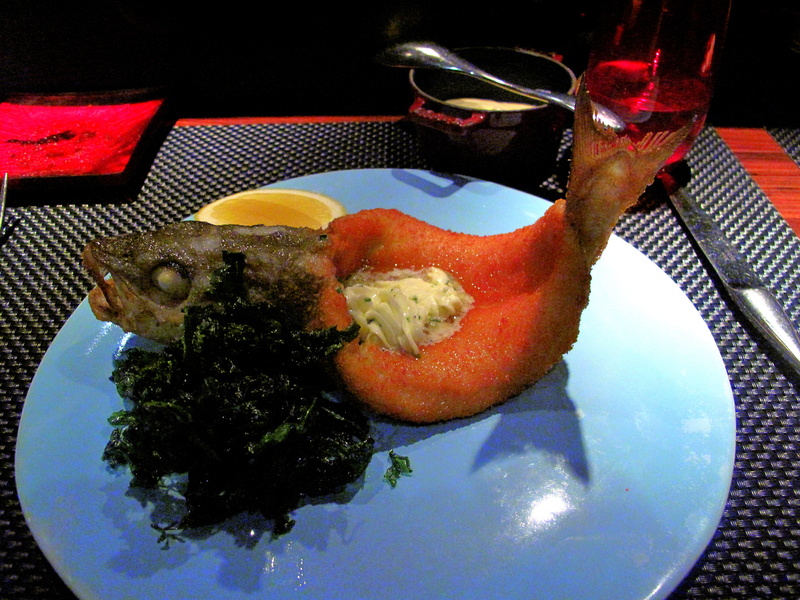 Worst of all, however, was the very ‘manufactured’ impression each dish left. A friend described l’Atelier as fancy fast food. Regretfully, he was right and this term was very fitting. An overriding sense of ‘process’ pervaded the cooking. The endless list of dishes were characterised by a central ingredient complemented with one or two additional flavours, all possible to quickly cook, served minimally, but usually in some striking fashion, just all seemed rather superficial to me. The overall effect was that I felt myself at a place of business (which of course it is…), whereby efficiency and economy are kings and the biggest victims, ingredient quality and my dining pleasure. From the locked front doors – no doubt thus kept to keep a queue outside and stir some curiosity and excitement – to the dispassionate black uniforms to the high, barrier-like counter tops to the conveyor-belt of dishes, there was a subtle impression of impersonality too. All this worked to underscore the superficiality, as did the ‘open’ kitchen, which though within easy view was really just for show, with little cooking taking place there and no interactivity between chefs and customers – as would be found in authentic sushi bars and what Robuchon said he had in mind. There were some successes. As mentioned, the interaction between customers was unanticipated, but delightful. Some of the more classic, straightforward dishes (l’Os à moelle, le Merlan, les Tartes), which appear in line with Robuchon’s recent thoughts – ‘there is a move towards less sophisticated cuisine. My mantra is ‘Eat the truth’. I hate going to restaurants where you don’t know if its duck, chicken or veal on the plate because it is so over-complicated. It’s a sort of cerebral masturbation’ – were nice too. These were nonetheless outweighed by what I did not enjoy and what can be summed up by a pursuit of form over function. Inevitably, with Joël Robuchon’s name above the door and two stars in le Guide, I wanted something significant. What I discovered was a shiny diner where the sizzle overshadowed the substance. 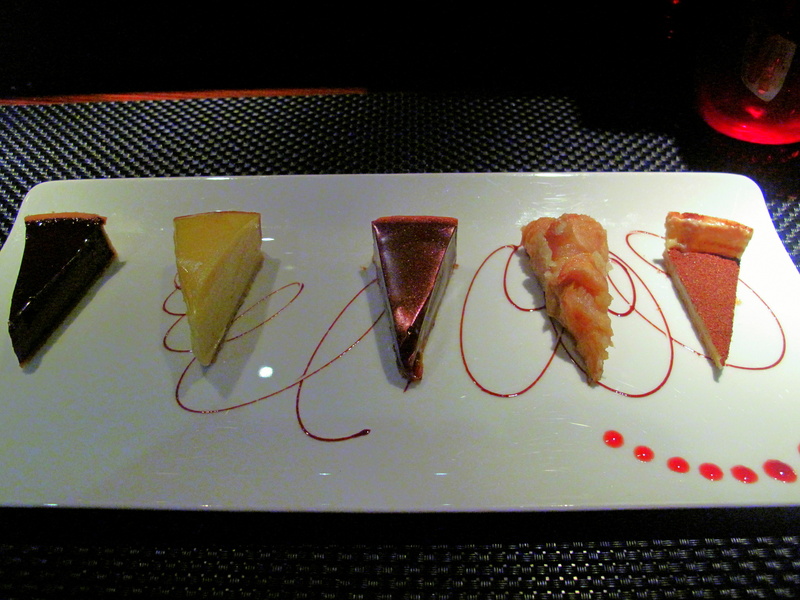 I cannot hold the restaurant responsible for the expectations evoked by its étoiles, as these were endowed independently by Michelin, but I guess Robuchon might be arguably excused on a technicality too: after all, I was eating at his atelier. Atelier is indeed an interesting appellation. Is it used here to mean a workshop, where one can see the produce produced into plates of food? Does it refer to the artistic aesthetic that is pursued? Or is it an indication of the cuisine’s handmade nature? I imagine that only one man knows for sure, but it has been also been argued that the title may hint of a meaning more in line with the Atelier method in art, wherein master artists run a studio of pupils who collaboratively compete in the creation of works made in the school of that master. This last sense pessimistically suggests that one should not expect ‘Robuchon’, but just an imitation of it. How does it compare to his 2* L’Atelier de Joel Robuchon in London, because that is a 1* star restaurant and not a 2* place. But that is the Michelin guide for you, because they give stars to restaurants that do not warrent them and yet ignore others that do, with Anthony’s in Leed’s being the prime example of there faliure to recognize a great restaurant?, and that is why the Red guide is loosing more and more and more credibility with the foodies, with each passing year IMO. p/s how many more French posts do you still have left? Both you and Gastromondiale share the reservations expressed on my website when l’Atelier first opened, and in much the same terms. Simplicity that goes slickly up-market smacks of the con game and the rip-off. KP: Allo Allo. Well, not having been to London’s l’Atelier, I cannot really judge. That said, after Paris, I do not want to either. 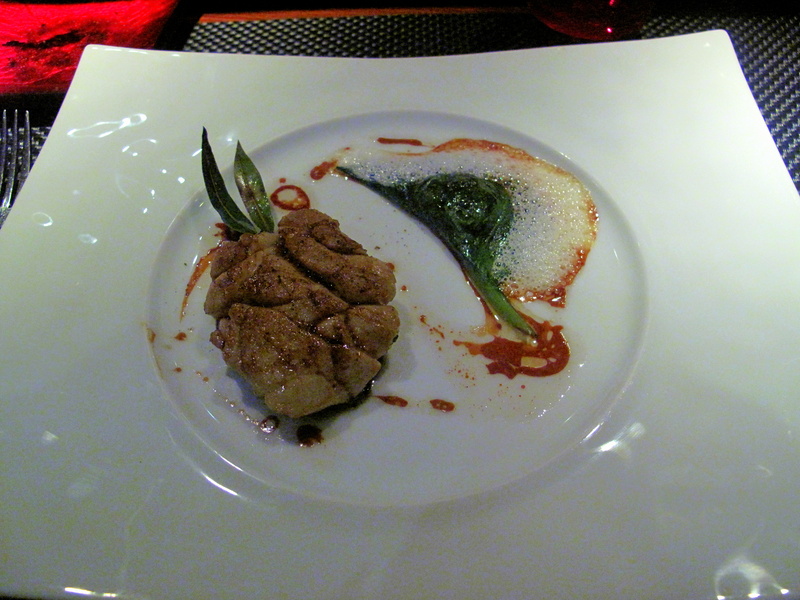 In last May, I went to La Table de Joel Robuchon with my friend Leo who was doing his internship at Les Ambassadeurs. We found le purée de pommes de terre was not as “legendary” as we expected. Moreover, we also thought the meal we had there was quite disappointing. The highlight of our meal was the amuse bouche…! After that…, nothing was really impressive. C’est bien dommage. 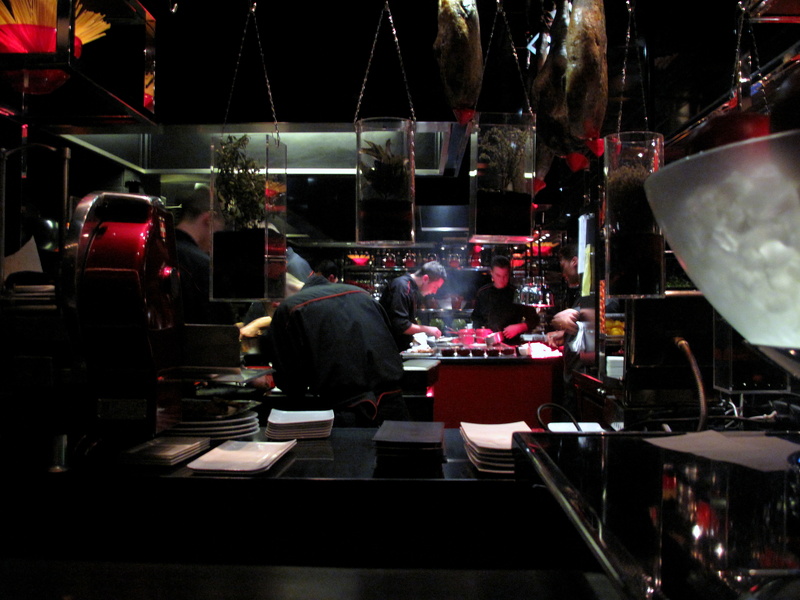 Iam working in macau for quite some time now and I have been to Robuchon a Galera for countless of times. I tried lunch, dinner and even gala dinner, when JR was actually in the kitchen overlooking the cooking throughout the evening. Most of the new dishes to be served in L’atelier and La table were actually first served in gala dinners over here every 4 months. 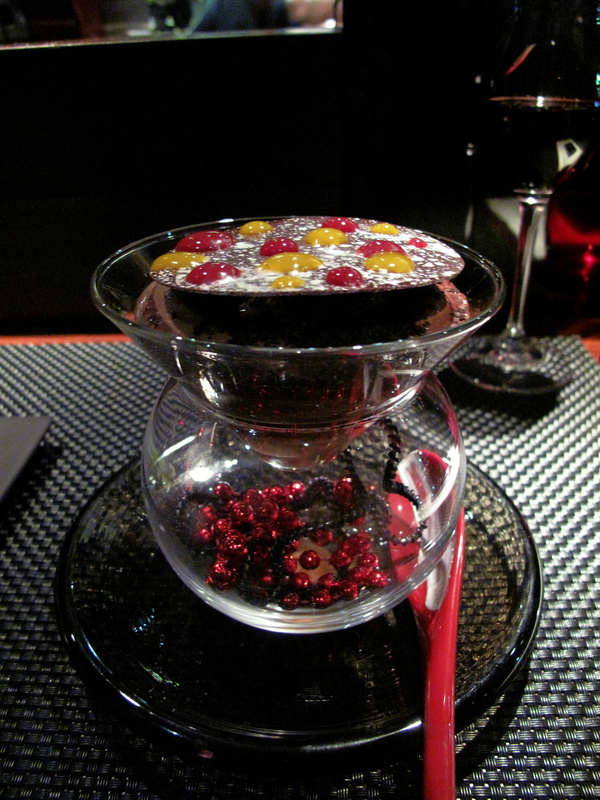 I would say that Robuchon A galera is wonderfully good! Thank you so much for taking the time to write these excellent posts. They are a true joy to read. We recently had lunch at l’atelier in London and were unimpressed. There was nothing particularly bad, but neither was there anything particularly memorable. Thanks, Desiree, for the information. It sounds like A Galera is worth a visit…shame it is so far away though! Robuchon in the kitchen?! Very nice. Hayo: I am really please that you enjoy them. I really appreciate you taking the time to say as much! I have not heard great things about London’s l’Atelier too – that’s why I have not made it there myself..
Yup you got it right! Robuchon in the kitchen but that only happens 3 to 4 times a year, and I don’t think he cooks but he supervises Iam sure. Normally a white truffle, black truffle, and a crustacean gala dinner depending on the season. You can go to Andy hayler’s website to check out the review that he had posted. I will check Andy’s review. I was aware he had been, but did not realise that he had attended a gala dinner there. RM: Indeed space age is one way of describing it! lol – luckily for me (although I’m sure it can be argued to the contrary) I do not have that problem!! My girlfriend and I have been to the Tokyo and Paris Ateliers and found them very different (admittedly the meals were at lunch and dinner respectively). The two restaurants’ decor — which I find naff and a little corporate even if I like the bar-seating concept — was almost identical but the service and food in the Japanese outpost was vastly superior. 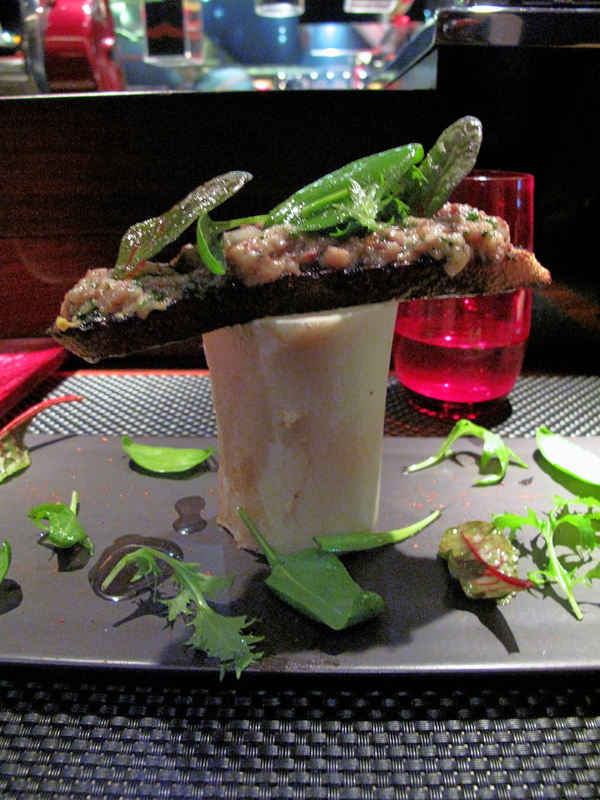 The meal in Tokyo was marked by charming service and a spirit of generosity that were both entirely lacking in Paris. The lunch menu was good value, as is typical in many Tokyo restaurants. The food was excellent and quite inventive. For the dinner in Paris, we showed up and not that unexpectedly were told we could be seated at 10 pm, two hours later — a time we happily spent walking around the 6th on a delightful evening when many of the neighbouring antiques stores stayed open late. Upon returning, seats had freed up yet the maitre d’ snootily insisted that we first wait in the bar of the hotel l’Atelier is connected to. We almost left after sitting in the charmless bar for twenty minutes, but it was my birthday and we felt we ought to wait it out. The food was mixed: e.g. a sensational dish of quail stuffed with foie gras (but where the foie gras was somehow on the outside) and, in contrast, an unbelievably mediocre tomato mozzarella salad. The portion sizes seemed to vary wildly, service was snooty and the meal was overpriced. 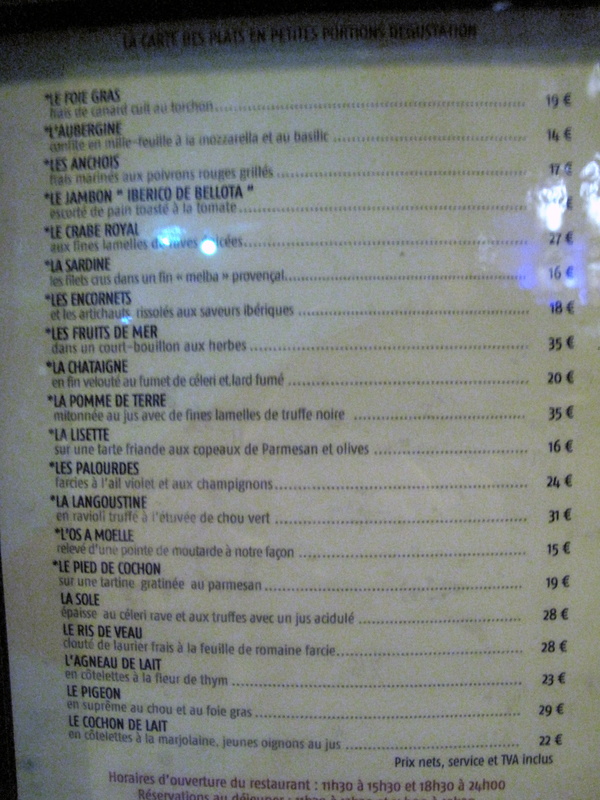 I’m not sure what to think about the Ateliers and Robuchon. On the one hand the Atelier ‘chain’ seems over-hyped and yet, even after our Paris experience, I keep wanting to like it. I am not surprised to hear the Tokyo branch were better. I have heard nicer things about NY’s too. 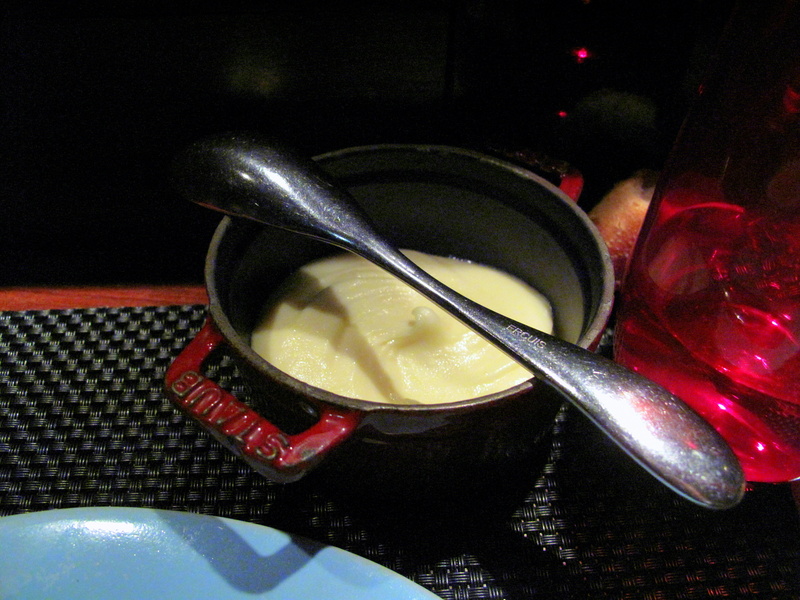 It seems I have not had the best experience with Robuchon or Robuchon-affiliated places (eg Le Pre Catelan). I definitely feel the Paris branch is a tourist attraction. Well, Tomato. If you are asking me, I would suggest skipping it – and I do not normally tell people not to try a restaurant. Otherwise, bon voyage et bon appetit! Wow this post is sure tasty and enjoyable as well. 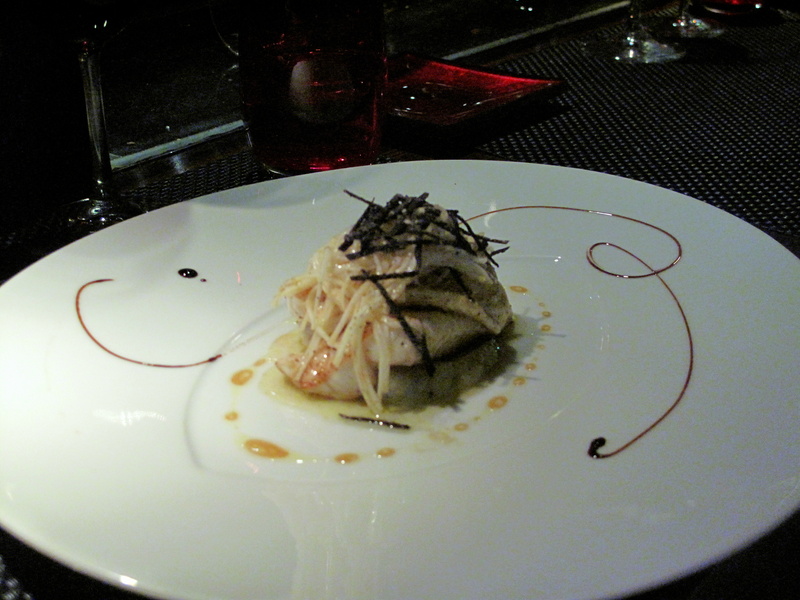 The restaurant is very well decorated and the dishes are presented quite artistically. Thanks for sharing. Hopefuly indeed, Paris Atelier is far more better…. Well, I took three of my children there on Sunday for lunch and they were bowled over, rated it very highly (and yes they have eaten at a few other Michelin starred restaurants). I have eaten there before and also in Tokyo and London. I would also rate Tokyo best, but then I can name any number of restaurants in Tokyo some found by Michelin and some not that knock pretty much everywhere else into a distant second. However I also enjoyed Paris and the service I have received there has been great twice in the last 6 weeks, both times at lunchtime at the weekend. And I have also enjoyed London a few times for dinner and again had great service and very well presented and tasteful food. But I happen to enjoy taster size dishes, as I like to leave a restaurant not feeling I have over eaten and I enjoy the greater variety from more smaller dishes. I’ve been to the Tokyo branch twice for lunch and it was fantastic both times. The staff is incredibly nice, smiling, attractive, fun, efficient and always open to a little chat. The food was excellent, the foie-gras stuffed quail with mashed potatoes, the langoustine ravioli with foie-gras sauce or the orange souffle with pistachio ice cream are simply wonderful dishes, executed perfectly. I’d rate it a solid one star, it’s too simplified for a two star, e.g. no friandise with coffee, just a biscuit. I like the concept of a quick lunch at the bar being able to eat just a dish or two. Usually, when one wants to enjoy food of this quality, one has to sit through a multicourse meal. i am a chef from india, and i really want to work in michelin starred restaurant or under michelin starred chef but dont know how to find my aim…..
and now i think it is impossible to find michelin starred work place….